I was sitting on my couch frantically texting my friend Suzy, “Maybe I’m making a huge mistake. What if it doesn’t work for me? Maybe now is not the right time.” I was half way through reading The Life-Changing Magic of Tidying Up by Marie Kondo and preparing to purge my closet. As I read accounts in the book of people giving away up to 70% of their things, I felt physically ill. Suzy did the KonMari method six months earlier and swears by what it did for her life. I wanted her to affirm that this wasn’t right for me. You may not recognize the book title, but you’ve probably heard someone talk about the seemingly insane process for doing a closet cleanse – evaluating what stays and what goes based on if it sparks joy. You literally take every single item of clothing out of your closet, drawers or wherever you are cramming it into, lay everything out on the floor and pick up each piece one by one, to determine if it “sparks joy”. What does that even mean? Everything from my closet laid out on my living room floor. The KonMari floodgates were open. It means that if you can get to the point of doing it, and actually do it, your world can open up in ways you never imaged. Like mine did. Kondo is a Japanese organizational and declutting expert who has sold over 5 million copies of her book, which details her KonMari method for discarding and organizing. She believes holding onto possessions that have outlived their usefulness actually makes us physically and/or emotionally sick and holds us back in life. This includes clothes, shoes, old notebooks, the junk drawer in the kitchen and snow globes we no longer love but feel bad parting with because they are supposed to be sentimental. She promises that if you do exactly as she instructs, your life will change (be more productive at work, have better relationships and gain more confidence) and you will never fall back into disorganization or clutter again. My closet Pre-KonMari. It was an over crammed disorganized mess that gave me anxiety. I wanted to purge in a more rational way, and not leave it up to a factor of joy. It seemed drastic and terrifying because I had a ton of clothes and I’m a collector. I had a vast shoe collection, a bag collection and a bow tie collection that took years, even decades to build. Did KonMari make exceptions for that? No. The upsides of the KonMari Method: The idea behind “Does is spark joy” is that your heart quickly makes the decision for you before your head can say, “But you spent $350 on that and it has some life left in it.” How much it cost, how often I wore it and if it’s still usable are actually not deciding factors. If it doesn’t spark joy, you don’t have time to hold onto it. A more fulfilling life is waiting on the other side of a pile of clothes donated to Goodwill. Allegedly. I finally finished the book and I started sobbing. A few really personal sentiments near the end caught me. Kondo explained how from a young age she didn’t like depending on others and she felt like she couldn’t trust people. She delved into organization and it made her feel safe. Even today she doesn’t always have a lot of self-confidence and she gets discouraged by her inadequacies. However, having an organized life gives her confidence and being surrounded by things and people that spark joy, brings her immense gratitude. It made me cry. I identified with what she was saying and I began to trust her. She asks you to write down your intention for doing the KonMari process—the first thing that comes to your mind. I wrote this: “I want to feel clean and free. Grounded and on time.” It made sense. I’m a very organized person, but it was organized chaos. While my house was clean, it was cluttered. I often didn’t feel grounded and I was never on time. It was clear I HAD to do this. I was yearning for a change. I set a date to begin the process. There’s an order--You start with all clothing related items (even socks and underwear). Then move onto books, paperwork, knickknacks, personal memorabilia (like trophies for races you won 25 years ago), junk drawer stuff, pictures and personal cards you’ve received. Those are the tough ones, which is why you save them for last. The book promises that if you do it in order in a relatively short period of time, you will be forever changed. I was ready for the miracle the book promises. I got to a point of trusting that this could work for me. That was the hardest part to get to. I can confidently say now, if you can get to the point of actually starting, you’ve made it through. You’re ready. Once I started, I couldn’t stop. About to see what "Sparks Joy". For me, the actual sorting was fun, almost cathartic. I was on my knees in the middle of my living room among piles of my clothes, like Alice in Wonderland. Time was suspended and I had to dig through to find the gems that would bring me back to my life. It was trippy and spiritual. The more I did it, the better my joy antenna was. Certain things I held gave me this gnawing feeling right under my rib cage. That’s no joy. TOSS. When something sparked joy it was so much fun (all the good memories flooded in or remembering why I loved it in the first place). It was like a secret bond between the item and I, something that felt like, “we both know why you’re staying”. I dug out this old rugby shirt that I wore on my first date with my husband twelve years ago and I felt immediate joy. Tears ran down my face. I held up a sweater with reindeer on it that my husband makes fun of and I laughed out loud because I love it. And who in Minnesota wouldn’t love a reindeer sweater? I kept it. By then end, when I looked over at my Joy section, the room felt bright and light. The giveaway pile made me uneasy. I couldn’t wait to get it out of there. Five and a half hours later, I got rid of 50% of what was piled on the floor. This is what remained. I went to Goodwill that afternoon and gave away twelve garbage bags filled with no joy. It only took five hours to go through all my clothes. I thought it would take days. My vast shoe collection took 2 and a half hours. The process removes any guesswork. I didn’t try on things in front of the mirror and think, if I lose 3 pounds this will look OK. If I held it up and there was no joy, I thanked the item (because that’s what Kondo tells you to do), and placed it into a giveaway bag. It becomes an instinct. I fell in love with the process. As I did this process a few things became clear to me. I had multiples of so many shirts or pants. If I found something I liked, I would buy 2 or 3 in similar colors. I purchased from a place of lack or scarcity—buying 1 or 2 back-ups of the same thing. While I was purging, it was often only the original one that I kept. I had multiples of everything – 16 pairs of similar boat shoes, 8 pairs of dark denim, 4 white shirts, 6 blue shirts. So many of the duplicates went. I kept asking myself, why did I keep buying the same thing over and over if I didn’t need it? Then I remembered, when I was a young kid, I took inventory of everything I had and I held onto everything. I would count up the shirts, sweaters and pants. As the number got higher, I felt more important. The more my closet was crammed full of stuff, it made me feel special. It was quantity over quality. And quantity doesn’t matter for two reasons: 1) no one knows how much you have on hand and 2) it’s unlikely that I ever wore all of that. The importance I placed on having a certain amount of clothes was just an illusion I created. After doing KonMari, I see that the insecure high school kid that added up the items in his closet to feel like he was enough no longer needs to do that. It’s totally cliché, but less is more for me now. 1. Clothes/Shoes/Bags/Belts/Outerwear: I gave away exactly 50% of everything. My prized shoe collection went from 65 pairs to 35 pairs. I went from 80 button up shirts to 40. I had a ton of blazers and suits from when I was a red carpet reporter in New York. I don’t have a need for most of those “looks” in Minnesota. At the end I have 3 sport coats and 3 suits left. I gave away about 25 ill fitting pairs of pants that I was holding onto “just in case”. It all went and I was fully OK with that. All the bags before KonMari. Ironically, most of them stayed. 2. Books: As I was going through my books (so many of them were self-help books I never even bothered to read), many didn’t spark joy or resonate. I picked up KonMari’s book and I felt joy. The rest I brought to all the free libraries in my neighborhood. 3. Paperwork: I dug out all these old files and realized I had phone bills or credit card bills dating back to 2000. I filled 15 bags with junk paper I’ve been holding onto. Having all that stuff wasn’t serving me. It was taking up space and collecting dust. 4. Bathroom: I went through my bathroom and slashed and burned all the products I bought but never really used but didn’t get rid of because it was almost full. And those little samples – she says if you haven’t used in 30 days, you never will. Not even when you travel. 5. Personal Letters: I got rid of so many cards and letters I was holding onto. I read some of them and it was great to recapture the memory. Kondo says we can get rid of the item, but we can hold onto the memory. She says to remember how it served you or added joy at the time it came into your life. Cherish that and move on. After you purge, then you organize. KonMari tells you how to fold and organize. I followed her prescription to a T. She very clearly promises that if you follow her book, do as she recommends and then organize as she recommends, you will NEVER lapse back into clutter or disorganization. She also says you will know how to shop for what you love. It has been exactly 6 months since I KonMari’d and I still feel a sense of peace inside me and surrounding me that I had never known before. It’s a relief. My closets and drawers are organized, and I feel like I have a personal relationship with each of my possessions. I chose them to remain, which means they bring me joy. I sometimes open my closet just to gaze at the organization. It’s like a temple. On days when it’s not so much a temple (yes, I sometimes get lazy), I can get right back in the saddle again. Once you know how to organize and keep things tidy, you can quickly ramp up if you start lagging. It’s much easier to clean, because you know where everything goes. My 2nd closet in the new house. As for being on time…I’ve been on time, mostly. Sometimes I’m early. A month after doing KonMari, my husband snapped a picture of me patiently waiting for a car to take us to the airport at 7am. I wasn’t still packing and he wasn’t rushing me out the door. I was ready on time, for the first time ever in the 12 years we’ve been together. He was in shock. Even if I’m in a rush, I still put the cap on the toothpaste. I can’t walk out of the house with products all over the bathroom vanity. I put things away where they belong. I never thought I could have done something like this. I can honestly say it’s in the top 10 things I’ve accomplished that I’m most proud of in my life so far. The only reason I got to the other side is because I had a slight bit of willingness to do it and a curiosity of what I could gain by doing it. And Suzy was my support system. When the book hit the NY Times best seller list awhile back, everyone seemed to be doing it. I was hoping the fad would die off so I didn’t have to do it. Then I finally did it and people took interest in my process and it opened up opportunities in my career. My article got published in the September Issue of MSP Magazine in print and online. 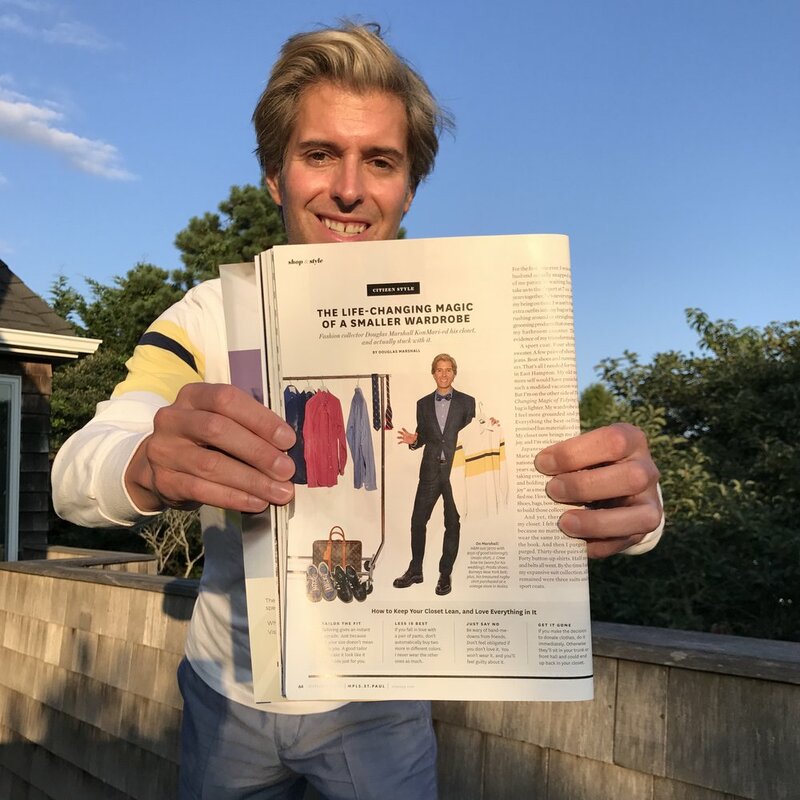 I wrote an article about KonMari for MSP Magazine, which led to a guest spot on MyTalk 107.1 radio about a closet cleanse. Then I was invited onto Fox 9’s The Jason Show to do a segment on how to purge based on if it sparks joy. The segment was such a hit that a producer at Fox 9 did it a few days after the segment, which led to them doing another follow up segment. As I’ve shared links to these stories or segments, I get more and more emails or comments from people who are doing it. It worked for me and I’m grateful to have the chance to share my experiences with the KonMari method—because I am inspiring others to do it and it’s changing their lives. It’s like a chain reaction for good. 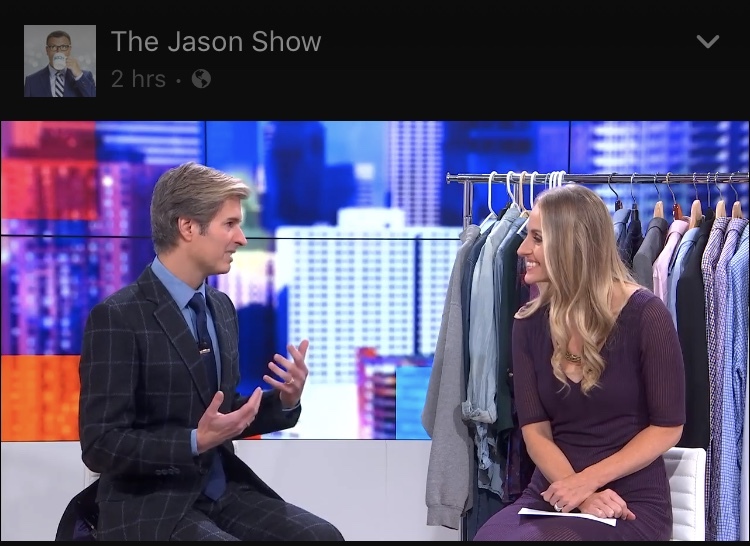 My segment on Fox 9's The Jason Show with Shayne Wells. If you’ve made it this far in my essay (you’re 2,444 words in), take it as a sign that this is your time to do KonMari. Something is calling you to do this; otherwise you would not have read this far. Clean out your closet and organize your home. A more joyful, organized and productive life is on the other side of the giveaway pile. I promise. If you have questions or want to share your own organizing or purging journey, e mail me doug@theworldofdoug.com! Share this article with someone it might benefit!